Breaking news from Highland underlines the importance of our petition PE01623 to remove unelected Church appointees from Local Authority Education Committees. The Scottish Parliament’s Public Petitions Committee will be reviewing this petition on Thursday. More when the Committee report becomes available. If there’s interest, I’ll post more. Click and select “View full size” (below image, R) for full resolution. 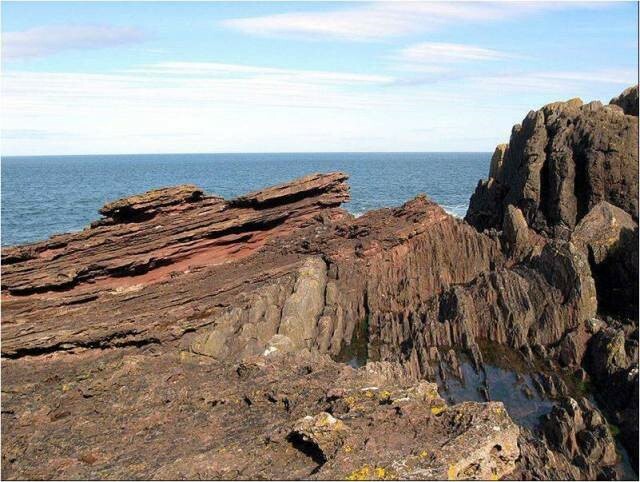 I lack formal training in geology, and would greatly appreciate comments on my proposed interpretations, but find structures such as these, on every scale, at once fascinating and beautiful. Long but detailed; updated resources include rebuttals to creationist claims, including dinosaur soft tissue, and teaching exercise on Lucy. I have mined this for links. There is also a discussion of bible-basd arguments, for those (like the author) to whom such things are important. From Robert Reich: “Trump is the ultimate price our political establishment pays for doing almost nothing to improve the plight of the bottom 60 percent of Americans for over thirty years” (more here); the relevance to the UK under successive governments, many of them Labour, is obvious. Relative dating from sedimentology dates back some 200 years, as beautifully explained here by my friend, field geologist and Anglican priest, Michael Roberts, with illustrations from what he has seen himself, while we have now had absolute radiometric dates for over a century. Index fossils are used only to establish that rocks are the same age, and the way creationists manage to forget this fact is indeed miraculous. This piece gains added interest because of its first-hand accounts, both of geological exploration, and of attempts to persuade creationists to accept the results. Yes, it is the old chestnut of Young Earthers that the age of rocks is based on a circular argument from evolution. It took me back to 1971 when I made the felicitous mistake of going to L’Abri to sit at the feet of the evangelical guru Francis Schaeffer. I arrived ther all bright-eyed and bushy tailed thinking of all the wondrous things I would learn in the next four weeks. I learnt much but not what I had expected.